Adult Burmese pythons are massive snakes, both expensive to keep and potentially dangerous. Owners have died due to handling mistakes with these snakes; they are not suitable for beginners and are generally best left in the wild. It's not easy to find someone to take a large snake if you can no longer care for it, and Burmese pythons are relatively long-lived. Be sure you are willing to make the commitment caring for a snake this size requires. All that said, however, these are magnificent animals, with beautiful brown and black markings, and make interesting pets for the right owner. Lifespan: Usually about 25 years. Burmese pythons are generally considered docile compared to other large snakes. Hatchlings can be skittish but are usually readily tamed with consistent handling. Still, these snakes are huge and quite aggressive feeders; they can inflict serious injury on their handlers. A second person should always be present when handling or feeding constrictors more than 8 feet long. Handle these snakes frequently from a young age or else they will be difficult to handle as they get larger. Touch the snake gently but firmly and be persistent if it resists at first. Avoid handling your snake for a couple of days after feeding or it may regurgitate. If your python wraps itself around you, unwind it starting at the tail. As your snake grows, it is recommended that you have at least one other person present even when you're only handling these strong snakes. It doesn't take long for a full-grown Burmese python to overpower a person. These snakes are voracious eaters and are often unintentionally conditioned by owners who only enter the cage at feeding time. If your snake associates you with food, it may take a nip at you one day, or worse, try to wrap itself around you. Try to socialize your snake gently so it doesn't view you as its next meal. A 55-gallon tank is fine for a younger snake, but as the snake grows, you'll need a larger and stronger enclosure. After the first couple of years, options include custom built wood and Plexiglass cages, or modifying a large closet or room for your snake. They are good escape artists and are very strong, so any housing for these snakes must be large, at least 8 feet long, 4 feet wide and 4 feet tall, strong and very secure. For young snakes, a half log or other hide sold at the pet store will work — even a cardboard box will suffice — but as they grow you will have to be more creative. Plastic storage bins make good hides for larger snakes - simply cut an access hole in one side, making sure there are no sharp edges. Provide a humidity retreat, especially when your Burmese python is shedding, by placing damp sphagnum moss in a hide. For hatchlings, use paper towels or unprinted paper. These are easy to clean and make it easy to monitor the health of the snake. For bigger snakes, indoor/outdoor carpeting is easy to maintain; keep a few pieces on hand and just switch them out when it is time to clean and disinfect. Linoleum is also a good option for large snakes as it also is easy to clean and disinfect. Pythons need a daytime temperature of 85 to 88 F with a basking area at 90 to 93 F. The temperature can drop to 78 to 80 F at night. Use spotlights, ceramic heat elements, and heating pads to maintain temperatures, but make sure lights are shielded to prevent burns. For large snakes, a pig heating blanket is a good option for maintaining temperature. Burmese pythons are usually good eaters, and it's important to be careful not to overfeed them or you will end up with an obese snake. Hatchlings can be fed mice or fuzzy rats, moving up to rats and eventually rabbits as the snake grows. The prey should be no larger than the width of the snake. Hatchlings can be fed one to two times per week but adult snakes only need to be fed every two weeks or so. Feed often enough to maintain optimum body condition. A dish of water should always be available for both drinking and soaking (for smaller snakes) and it should be changed frequently. As the snake gets larger, it will no longer be able to soak in its dish so you will need to regularly allow the snake to soak in a tub or pool of water. The most important consideration when choosing a Burmese python is whether or not you have the time, space and patience to care for it. Many owners become overwhelmed, resulting in captive-bred pythons being released into the wild (which is illegal in most areas for obvious reasons. 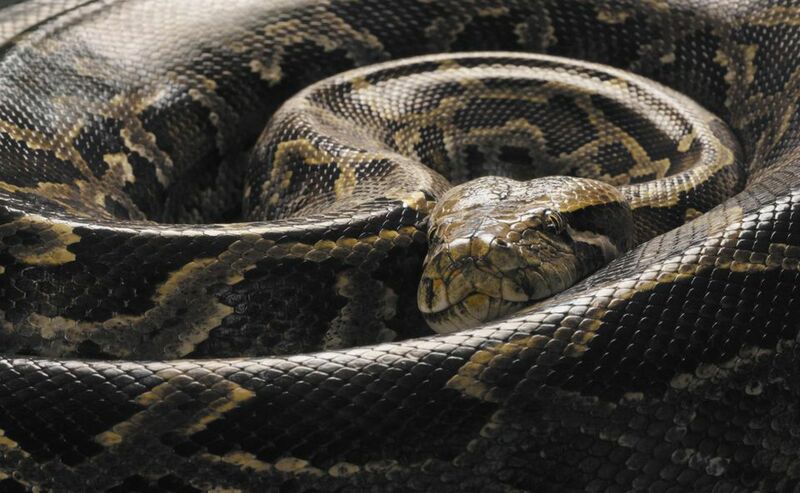 The best way to become the owner of a Burmese python is to get one from a reputable breeder who can tell you of any health issues the snake may have. Burmese pythons are often the targets of poachers due to their beautiful and intricate patterns, and many snakes abandoned by their owners fall into the wrong hands. A healthy Burmese python hatchling will have its unique coloring as soon as it comes out of the shell, so don't accept any snake that doesn't "look" like a Burmese. Any signs of lethargy, redness around the mouth or signs of a respiratory infection are indications of a snake that has not been well cared-for. One of the most serious ailments to afflict the python and boa family of snakes is inclusion body disease or IBD. This fatal virus is often spread from one snake to another, and its symptoms include abnormal shedding, anorexia, constipation, tremors, and loss of motor control. Many snakes with this disease starve to death because they can't digest any new food, even if force fed. Like other reptiles, Burmese pythons are susceptible to respiratory infections and mouth rot, or stomatitis. A snake with a respiratory infection will breathe with its mouth open or wheeze. Mouth rot will show as a reddish discoloration around and in the animal's mouth. It's important to have a veterinarian check your Burmese python annually for any signs of disease; many don't show symptoms until the animal has been suffering for some time.